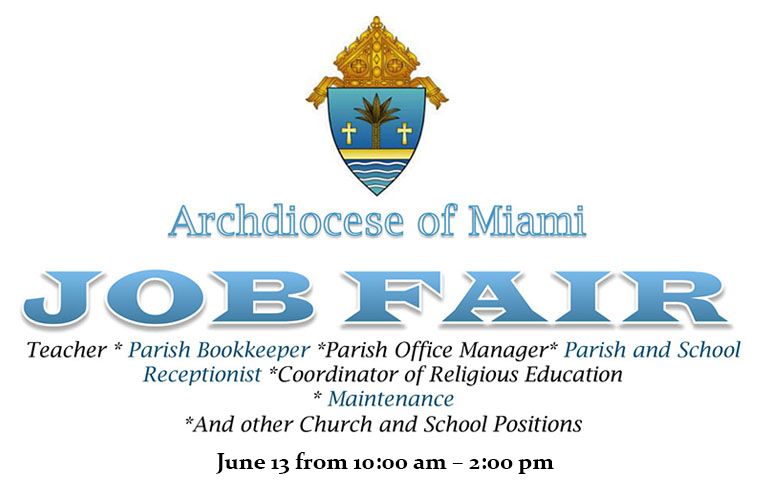 Welcome to the Archdiocese of Miami job openings page. Below you will find the links to employment opportunities currently available within the archdiocese. Read each posting thoroughly and follow the particular instructions on how to submit your resume properly. The Archdiocese of Miami understands the importance of providing quality-of-life benefits and considers them to be a significant part of employee compensation. Eligible Archdiocesan employees will be provided with $15,000 life insurance, $15,000 accidental death & dismemberment insurance as well as long-term disability insurance to provide income protection in the event of illness, injury and/or inability to work. The Archdiocese will share the cost of your choice of three medical plans: PPO, HMO or Value HMO. Optional Dental PPO and HMO Plans, Short Term Disability, Supplemental and Spouse Life Insurance will be available on a voluntary basis. The contributions made by the Archdiocese of Miami and its Entities are like a second paycheck, providing for a wide range of benefits to support the needs of our employees and their families. As the Church professes that "Life and physical health are previous gifts entrusted to us by God. We must take reasonable care of them" (Catechism of the Catholic Church 2288), the Archdiocese is an advocate of quality care and works to provide our employees with quality benefits. All employees hired by the Archdiocese of Miami will need to complete the Archdiocesan criminal background screening prior to employment, and participate in Safe Environment Virtus Training (U.S. Bishops' Charter for the Protection of Children and Young People) shortly after hire. Interested applicants will need to submit an updated resume, cover letter and application to the email provided on the job posting.